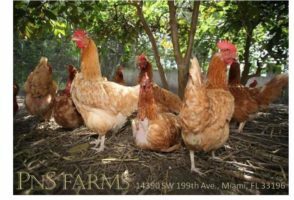 Our hens are housed in a wooden barn, comparable to the Ritz for people, where they eat high quality certified organic soy free feed (no antibiotics, no hormones, no animal by-products, no food from GMO crops). They lay their eggs, porch and sleep on ladders, as they love to sleep high off the ground. The floors are concrete covered with pine shavings to keep humidity out and maintain cleanliness (shavings changed weekly). They have continuous access to outdoors where they pasture, enjoy the bugs, sun, fresh air and shade under the guava trees. They love to exercise, climb on the trees and pick the fruits. While many of us enjoy sunbathing on the sand, they enjoy sunbathing on the soil. These are truly happy hens that produce safe, healthy and nutritious organic eggs. We go to extremes to safeguard their well-being – no shortcuts here or anywhere else.